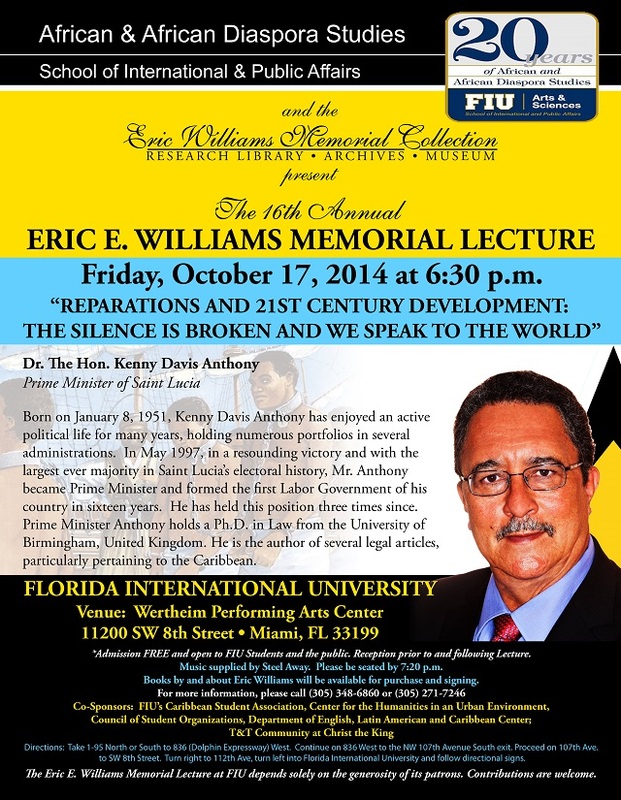 The Honorable Dr. Kenny Davis Anthony, Prime Minister of St. Lucia, will give the 16th Annual Eric Williams Memorial Lecture “Reparations and 21st Century Development: The Silence is Broken and We Speak to the World." To see Hon. Dr. Anthony's biography, please scroll down. This event is organized by AADS and the Eric Williams Memorial Collection and is co-sponsored by the Caribbean Students Association, the Center for Humanities in an Urban Environment, the Council of Student Organizations, the Department of English, and the Latin American and Caribbean Center. Born on January 8, 1951, Kenny Davis Anthony’s consciousness drove him to become active in politics at an early age. He left his first love of teaching for politics shortly after Saint Lucia’s Independence in 1979, having been active in the Saint Lucia Labour Party victory of July, that year. Prior to this, the Labour Party had languished in Opposition for a decade and a half. Departing from his short stint as a part-time tutor at the University of the West Indies, Anthony became special advisor in the Ministry of Education and Culture under the Allan Louisy Government in August of 1979. In December of 1980, he was then appointed a senator and Minister for Education, just shy of the age of thirty. He held that position until March of 1981, retreating to academia, in the Law, after the premature collapse of the Louisy Government. Consequently, he spent most of his academic and professional life out of Saint Lucia. This included being a Lecturer at the Faculty of Law at the University of the West Indies, Cave Hill Campus, and as the Caribbean Community (CARICOM) Secretariat’s General Counsel, based in Guyana. He returned to active politics as Political Leader of the Saint Lucia Labour Party in 1996, during a troubled social and economic climate. Dr. Anthony led his party to resounding victory in the General Elections on May 23, 1997, with the largest ever majority in Saint Lucian electoral history, sixteen seats to one. Anthony became Prime Minister and formed the first Labour Government in fifteen years. After a 14-3 victory in the December 2001 General Election, Anthony again formed a Government for the second time. His party lost the December 11, 2006, General Election 6-11 and he became Leader of the Opposition. However, he was returned to the office of Prime Minister following an 11-6 Labour majority at the November 28, 2011 poll. Dr. Anthony hails from the Saint Lucia’s southern community of Saltibus and has represented in the House of Assembly the electoral district of Vieux Fort South since 1997. Prime Minister Anthony also holds the portfolios of Finance, Economic Affairs, Planning & Social Security. He is the holder of a PhD in Law from the University of Birmingham, United Kingdom. He has three children and is married to Professor Rose Marie Belle Antoine, Dean of the Faculty of Law, UWI, St. Augustine.